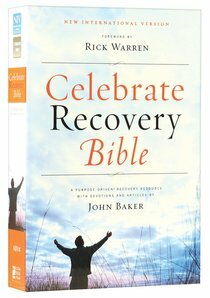 About "NIV Celebrate Recovery Bible"
Find freedom from life's hurts, hang-ups, and habitsIf you long to break free from life's hurts, hang-ups, and habits, the NIV Celebrate Recovery Bible is a powerful and positive ally. This Bible is based on eight recovery principles found in Jesus' Sermon on the Mount and on the underlying Christ-centered twelve steps of the proven Celebrate Recovery* program. The NIV Celebrate Recovery Bible lifts you up and shows you how to walk, step by attainable step, on a path of healing and liberty.Based on the proven and successful Celebrate Recovery program developed by John Baker and Rick Warren, the NIV Celebrate Recovery Bible offers hope, encouragement, and, through developing a relationship with Jesus Christ, empowerment to rise above your hurts, hang-ups, and habits. With features based on eight principles Jesus voiced in his Sermon on the Mount, this insightful Bible is for anyone struggling with the circumstances of their lives and the habits they are trying to control. FEATURES* Full text of the world's most popular modern English Bible---the New International Version (NIV)* Articles explain eight recovery principles and accompanying Christ-centered twelve steps* Over 110 lessons unpack eight recovery principles in practical terms* Recovery stories offer encouragement and hope* 30 days of devotional readings* Over 50 full-page biblical character studies are tied to stories from real-life people who have found peace and help with their own hurts, hang-ups and habits* Book introductions* Side-column reference system keyed to the eight recovery principles* Topical index'I'm excited you're beginning the journey to recovery. Your life will change. You'll experience freedom from your sinful habits, hang-ups, and hurts as you give up control and allow Jesus to be Lord in every area of your life. 'From the foreword by Dr. Rick Warren, senior pastor, Saddleback Church 'Throughout the pages of Scripture, we see God's heart for celebrating recovery! This collection will help you experience and celebrate that journey, one step at a time. Jump in and see how recovery and spiritual growth are one and the same.'Dr. Henry Cloud, Christian psychologist, author, and speaker*Celebrate Recovery is a biblically based program that helps those who are struggling with hurts, hang-ups, and habits by showing them the loving power of Jesus Christ through the recovery process. The Celebrate Recovery program is offered in thousands of churches worldwide.